The Fives board would have been regularly seen in the East End of London, however, few still use it. The so-called standard dartboard is also called the London board and, in some cases, referred to as a clock board; or could this be a reference to the London Five? The Fives Dartboard has twelve set scoring areas hence to say the same as twelve numbers on a clock face but the reference to a clock board In the Guinness Books of Darts by Derek Brown refers the ‘Clock’ / ‘London’ board the board we refer to as the standard board of today. I leave you all to ponder! The throwing distance is 9ft from the face of the board measured horizontally. 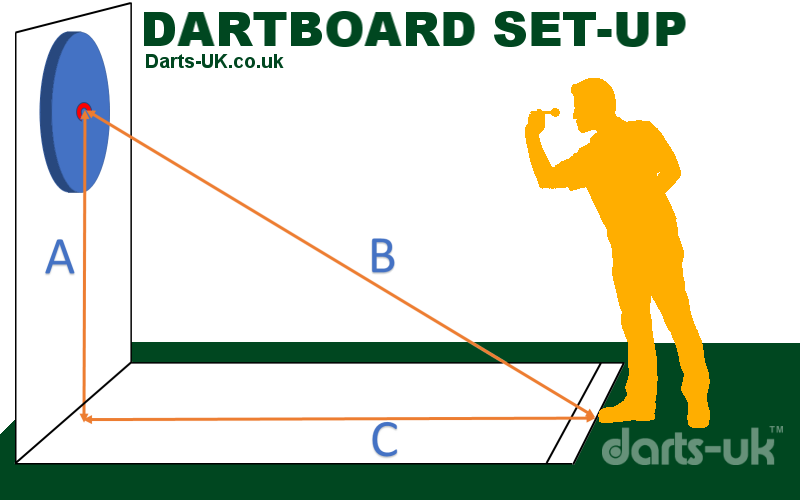 This equates 10ft 6ins when measuring from the Centre Bullseye to the rear of the oche. The toe-line or oche shall be clearly marked and should be at least 18ins long. The toe line can be just a painted line on the ground or a securely raised line indicator such as a piece of wood or metal. The latter is preferable as the thrower has a firm edge to rest his/her foot against. I believe the Ipswich Fives dartboard set-up is the same as the London Fives. The order of play is either determined by a toss of a coin or by each player throwing for the centre bull the nearest being the player that throws first. The rules here can vary depending on the league you may be playing in; the local rules should be observed at all times. Once the order of play has been determined the winner will start leg one and odd legs after that. The loser will start leg two and even legs thereafter. Any standard darts may be used. A throw consists three darts except were the game is finished in less. Darts cannot be re-thrown this includes darts that miss the board and darts that bounce of the board wiring system. Only darts that have their points touching the scoring area of board score. A player may be told, if he asks, what number they scored, or what number he requires for the game, by the score announcer, but not how to get it. If the number required for the game is exceeded in the course of a throw, throw ceases, and no account is taken of the score obtained during that throw. The game is to score 305, 505, 705, 805 or 1,005 as previously agreed. The game is played as per the standard 501 games except the starting number ends in a 05 not 01. Generally, each player’s score must start and finish a game with a double (The narrow outer ring of the board). Competition games, however, are usually played with a straight start (no compulsory double) but with a compulsory double to finish. The first throw is deducted from the player's start number e.g. 505 and then from the subsequently reduced total. The scorer should show both the score obtained for the throw and the reducing total remaining. For fast Practice games play 305. For competition 505 and for pairs usually 705. In fact, any agreed starting number can be used but usually, the number should end 05. If you are playing in a league always refer to the league rules as these can differ by area and league.